Dark circles bringing you down? Are you tired of searching for the right anti-ageing eye cream to diminish that drained look? SanRe have cleverly formulated the right eye cream for dark circles to eliminate puffiness and dark circles. Your body and skin should only absorb the vitamins and minerals it deserves. SanRe have made certain that this natural anti-ageing eye cream is enriched with the correct ingredients to make the skin surrounding your eyes healthier.The anti-wrinkle cream is organic and is designed to strengthen elasticity, smooth out wrinkles and create firmer, healthier skin. Why SanRe’s Eye Candy is right for you? SanRe’s anti-wrinkle eye creams are USDA Organic and are supported by Green America and Leaping Bunny. SanRe are proud that all of their anti-ageing creams and serums are created, tested, improved, finalised and produced by SanRe themselves and their willing friends and family. 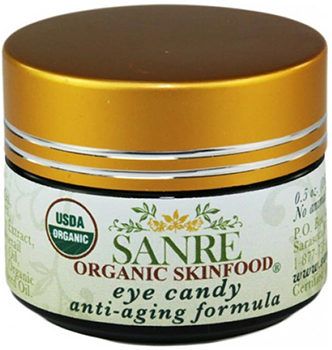 SanRe’s Eye Candy is enriched with oils that reduce puffiness and work to soften and nourish the skin around your eyes to make them visibly younger. Almond oil is considered as an anti-ageing eye cream miracle, with powerful anti-ageing properties that reduce dark circles and aid tackling crows-feet. Beeswax is a natural emollient that hydrates and protects skin from harmful toxins that your skin may absorb. Apply a thin layer of the anti-wrinkle eye cream around the eye area and use a gentle tapping motion to aid absorption. Eye Candy can be used as a day or night time cream but is recommended for use before bed. Ingredients: Organic Almond (Prunnus Amygdalus Dulcis) Oil, Purified Water (Aqua), Organic Aloe Vera (Aloe Barbadensis) Gel, Organic Beeswax (Cera Alba), Organic Citrus (Citrus Aurantium) Extract, Organic Horestail (Equisetum Arvense) Powder, Organic Chamomile (Anthemis Nobilis) Essential Oil, Organic Fennel (Funiculum Vulgare) Essential Oil, CoQ 10 – Vegetarian and Non-GMO, Organic Rose (Rosa Damascena) Essential Oil, Organic Rosehip Seed (Rosa Canina) Oil.